AN essential ingredient of getting the SLENZ Project off the ground has been to ensure the builds have enough realism to ensure a “suspension of disbelief” occurs, according to the project’s lead developer, Aaron Griffiths (SL: Isa Goodman). This, Griffiths (pictured) told the SLENZ team recently, was to allow users to become fully immersed in the experience without feeling it didn’t look/feel real. “This is a difficult task when faced with the rigidity that building using Second Life’s 3D primitives have inherent in them, given the hard lines that these building blocks present,” he said. It had been circumvented in the past, he added, through an intense use of multiple primitives to form every bend or curve of an object but this not only loaded a scene with primitives (more download requirements) but also added to the workload in creating and aligning textures to each of the primitives to create a complete object. Therefore, he said, he had been excited to discover within Second Life Rusalka Writer’s large sculptie sets with what he feels is the desired level of realism to make the build “that much more than a 2D drawing” one can move through. “So now, in the birthing room for example, we have rumpled eiderdowns and flowing drapes as opposed to the not so real faked 3D using shadowed textures on rectangles,” he said. The Rusalka Writer sculptie sets at her shop in Bahoozamoth, Griffths, a director of F/Xual Education Services, said, were full permissions and inexpensive compared to most of the sculpties sets he had seen in-world. Griffiths said that besides the realism/immersion issue he also had been concerned for sometime about the lack of interaction with the build in Stage 1 of the SLENZ midwifery build. “But interactive… well not quite,” he said adding that he had been struck by the fact that when he had recently met some of the midwives in-world for a walk-through without exception, when they had entered the birthing room, they had attempted to enter the birthing pool. The “real” thing … all the midwives wanted to try the birthing pool. “Well you would wouldn’t you?” he asked, and added, “… yet this aspect of engaging with the build had not been really considered for this stage despite his and other’s interest in the capability of MUVEs to present the aspect of play in a learning experience. Building on that observation, he said he had talked to the midwives about the possibilities and it had been suggested that, as well as clicking on each of the items displayed to present different birthing techniques (e.g. the birthing pool, the leaning mantle, the rope etc) and linking out to information on the web relating to the theory involved, “we create pose animations for each of the objects that would optionally allow the users to “assume the position. “Not only would this be instructive in a sense but would insert an element of fun that I feel is distinctly lacking in this stage,” he said, asking for the team’s thoughts on the idea. Looking forward to Stage 2 of the midwifery build where the SLENZ Project intends to simulate a normal childbirth scenario there had also been a boon in discovering the Rusalka Writer sculptie sets, he said. “Again in terms of suspending disbelief it is important in my view that we create as realistic a ‘baby’ as is possible,” Griffiths said. The creation of a prim-based, scripted robot, or an avatar-based bot, logged in specifically for the birth, had been discussed but both had their drawbacks: the prim bot ,though easily manipulated through scripting ,would be hard to make look real, while the avatar would have to be logged in (complete with floating name and title) and manipulated, with the problem of animation permissions to be overcome. “What a joy then to find amongst the sculptie sets a full set of body part shapes that with good texturing may solve our problems in this respect,” he said. “All-in-all a good week for the developer with a much better sense that the midwifery unit will immerse, engage and have the end result that we all are heading towards,” Griffiths concluded. The “real” thing … a bed that looks soft enough to sleep on. 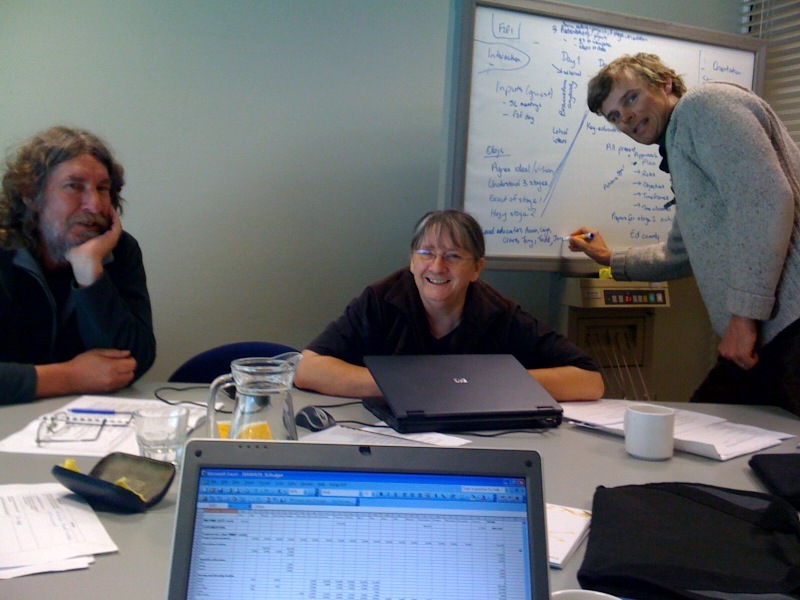 Gearing up for a face-to-face meeting in Wellington, New Zealand, in two weeks time ( March 23-24) the SLENZ Project team is now moving steadily forward with its three pilot programmes – Foundation learning, Midwifery and Orientation – according to joint project leader, Terry Neal (SL: Terre Tinkel) in her latest project update. With co-leader Dr Clare Atkins (SL: Arwenna Stardust) she expects to be able to post the agenda for the face-to-face meeting early next week. Speaking about the individual pilot programmes Neal reported that Foundation learning lead educator Merle Lemon (Pictured at right, SL: Briarmelle Quinetessa) , of Manakau Institute of Technology, had written a context and learning design for Foundation Stage 1 (blog, best in Firefox, describes the foundations students and the issues simply and extremely well: http://briarmelle.edublogs.org/2009/02/26/foundation-education-context/ )with work to begin on the build (http://slurl.com/secondlife/Kowhai/138/177/26 ) shortly. The Foundation pilot group plans to hold an in-world meeting at 9am on March 17 with the aim of understanding potential access issues for fellow educators in the programme and to give them an opportunity to provide feedback on the learning design and as much of the build as is completed. Neal said that work on the in-world build for Midwifery Stage 1 had been delayed by challenges in deciding which items to include in the birthing unit for Stages 1 and 2 and by finding suitable images. As a result team members Deborah Davis and Leigh Blackall, project learning designer (SL: Leroy Post) had even visited a local hospital to take pictures. The midwifery team, Neal said, had organised an interview session for the video that was being made “to engage” tutors and learners before they entered Second Life, while Sarah Stewart (Pictured lower right, SL: Petal Stransky and midwifery pilot lead educator) and Blackall had begun developing lesson plans. At the same time Davis and Stewart had devised labels for the various objects which would be in the birthing unit. A feedback session for the pilot’s educators has been organised for March 2o. place to do this is the Googledoc for orientation linked from the one stop shop SLENZ blog as the Context Summary Document-Orientation ( https://slenz.wordpress.com/slenz-project/project-processes). Neal said the protocols for the evaluation of the project were still being determined. Concluding, Neal hoped the introduction of the “one-stop shop page (for “understanding our process and accessing the various documents we are creating to communicate with one another”) in the SLENZ blog would help team members all feel they could navigate “through our many files more easily and help us differentiate between ‘thinking out loud’ and ‘decisions’. two months ago. Clare and I both believe our discussions to date have helped us create something that will work well for the rest of our project, and beyond. Three New Zealand education/training institutions have been “shortlisted” for the Second Life Education New Zealand Project. The project, funded by the New Zealand Tertiary Education Commission, has been designed to determine whether New Zealand education can benefit from “new” virtual world internet technology. The initial selection, from six formal proposals from across New Zealand, was made by a four-person SLENZ team, Terry Neal and Dr Clare Atkins, joint project leaders, the project’s learning designer, Leigh Blackall, and lead developer, Aaron Griffiths. The proposals from which the selection was made included: language learning, including Te Reo; medical training; foundation learning; information technology and retail training. The names of those selected are expected to be announced before the end of the month after final evaluation by the SLENZ project steering group. The innovation project, which has been set up on the Second Life islands of Koru and Kowhai, owned by NMIT, aims to determine how multi-user virtual environments might be used to improve student learning. 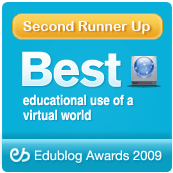 Though not in a realm of tertiary education a study of the effects of a digital learning environment designed to improve elementary student writing, has come up with some useful and sometime thought-provoking answers to questions often posed by educators in all fields of virtual learning. By Warren, Scott J Dondlinger, Mary Jo; Barab, Sasha A , and posted in the redOrbit Knowledge Network (http://www.redorbit.com/news/education/1576546/a_muve_towards_pbl_writing_effects_of_a_digital_learning/index.html), an online community specifically for those with an interest in science, space, health and technology, the paper is entitled “A MUVE Towards PBL Writing: Effects of a Digital Learning Environment Designed To Improve Elementary Student Writing”. The project on which the paper reports endeavored to solve two major obstacles to using problem-based learning methods with writing in elementary school classrooms. The problems are the time taken to design the learning environment and the time required for students to interact at their own pace with ill-structured problems used to spur student writing. The study determined that game elements could be used along with Problem Based Learning (PBL) in a digital learning environment to improve student writing. The results from this study, which could be used as a basis for foundation learning, included statistically significant decreases in teacher time spent answering procedural and directional questions, increased voluntary student writing, and improved standardised achievement scores on writing tasks. She has uploaded it to (http://seekersbrain.wikispaces.com/Reports+and+Articles) to make her list available to anyone who wishes to use it. At the same spot she provides a link to a valuable hypertext book which explores the psychological aspects of environments created by computers and online networks. The difficulty of being a newbie in a strange land never ceases to surprise me – especially when I visit new OpenSims that don’t have the facilities of Second Life – and many of them don’t. They feel more like Second Life of three to four years ago with the inherent problems of lag and crashes and lack of easy to obtain freebie clothes, skin and hair etc. Even walking like a penguin can prove a pain in the proverbial with AOs largely ignored. However, for newbies or noobs entry to Second Life also can still be a painful and often offputting experience without the other pressures of non compatible or elderly computer technology, slow broadband and other grief causing problems. Announcing that Linden Lab had engaged award-winning interactive design agency Big Spaceship as a partner in transforming the Second Life experience, Benjamin noted that tailoring the Second Life platform to make it easier for new Residents to begin experiencing the virtual world had been “one of our primary objectives moving forward”. 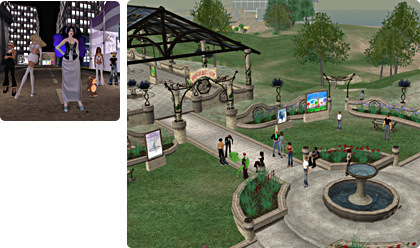 “The goals of the project are to dramatically simplify the sign-up stage, ease users’ introduction into Second Life, and quickly connect people to relevant content and experiences in Second Life,” he said. Big Spaceship (http://www.bigspaceship.com/), an interactive design agency with expertise in user experience strategy, interface design, and Web development, is well known for its work creating compelling online experiences that are approachable and engaging. The latest Linden move hopefully will do something to turn around the sometimes claimed 80 percent churn/loss rate in new residents.